Why do some teams outperform others? Why does the sum total equal more than the parts? For many, the answer refers to the ‘team culture’. But what exactly does this mean? And more importantly, how can you best develop it within your team? This year has been described by many as the year of ‘the underdogs’ (think Leicester City, Iceland and Wales punching well above their weight). Many have attributed their success to their team culture, often describing the players as a ‘band of brothers’. But what drives individuals to come together as a team? Leading researchers explain organisational culture as ‘shared values, beliefs, expectations, and practices across the members a group’. Culture is defined as something everyone feels, but cannot see; existing as an unspoken understanding of ‘how we do things around here’. Sport specific studies and reviews show this can include traditions, rituals or symbols unique to the specific team. It is shown that the adaptive qualities of being open to new learning and flexible to change prevent performance stagnation. Conflict, which inevitably happens, can be managed to enhance growth and creativity, problem solving and have positive effects on team effectiveness. Take time as a team to consider what your culture is. What are the important values, beliefs, behaviours and the vision you encourage and work towards? Culture is not rigid and neither will it necessarily always stay positive or negative. It becomes dependent on mindset (growth or fixed) and psychological momentum of everyone in your team. They say positivity or negativity is infectious – the same is true of culture. Everyone holds responsibility for how they want the team to be, and they need to know this. If you really want your team to buy into a particular culture, then they need to be the ones to take ownership, generate it and put it into practice. The way majority of athletes said their teams learnt to be adaptable was to experience different things together. These experiences are completely dependent on the priorities of the team. However, what became clear was that if a team learns to deal with challenges together, they will learn to overcome them together (as noted by Wales captain Ashley Williams below). This is more effective than them learning in separation; it keeps them cohesive and promotes confidence and reliability in one another, which all favour better performance. Do not prevent conflict from happening – it shows to be a very constructive way of resolving unspoken doubts or concerns within the team. It encourages individuals to think of alternative ways of solving a problem or overcoming challenges. Remember, conflict works when it is managed effectively – constructive criticism and discussions are the more positive ways of dealing with conflict. This approach is one of the cornerstones of the successful New Zealand Rugby Team. Being able to talk openly, honestly and constructively, without taking personal offence is an important part of the process. (You can read more about how The All Blacks develop their team culture, in our blog here, ‘Why Are New Zealand So Good at Rugby’). This links into using conflict effectively. Involving the whole team (e.g. athletes & coach) in the decision process not only encourages adaptability, it helps build team cohesion and can empower your athletes through the opportunity to make decisions. A healthy team discussion about which direction to take and why can help squash doubts and make sure everyone is on the same page and working towards the same goal. 6. Include everyone in the culture (make sure the team knows who the ‘team’ is). As has already been mentioned, culture is everyone’s responsibility – it does not just stop at the athletic team. Whilst leaders or coaches have a big role to play in setting the expectations, visions and morals, especially for younger teams, you need other members of the team to help you spread the message. For many this involves the welfare and support staff. All the other individuals that work to optimize the athletes’ performance need to buy into the same culture, led by the same expectations, in order for it to truly become alive. A great example of this was seen by the many different component parts at Leicester City coming together to work towards a single goals. 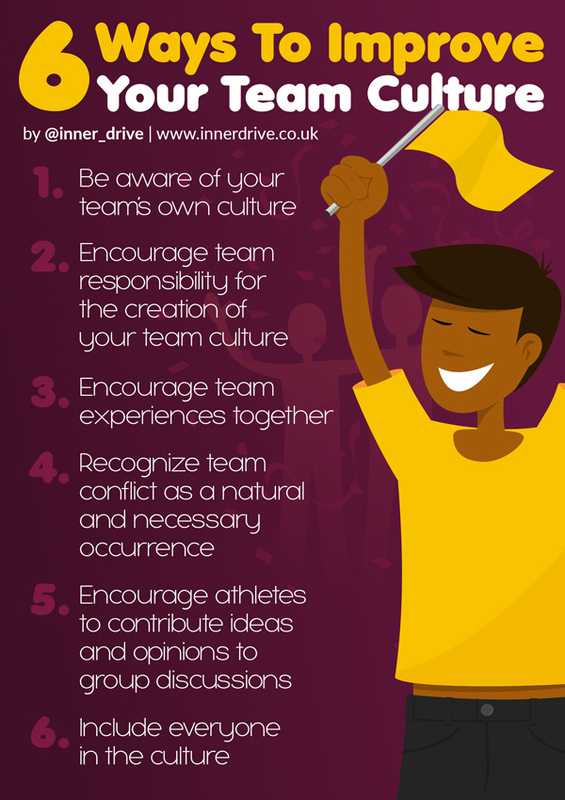 Developing an effective team culture is difficult. Getting players to sacrifice the ‘me’ for the ‘we’ can be challenging. However, the rewards are worth it. As Aristotle, and later Gestalt psychologists noted, ‘the whole can be greater than the sum of its parts’.